After my radio broadcast on the relics of scientists in museums around the world (http://www.abc.net.au/radionational/programs/ockhamsrazor/preserved-scientists/8624266), I received a number of suggestions for creepy additions. So I’m starting a blog here on creepy objects in science museums. 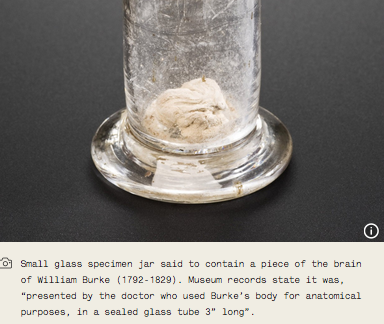 Here’s the first: from the grave robbers and murderers Burke and Hare, a section of Burke’s brain that now resides in the Wellcome collection. According to Wellcome Web editor Kirsten Riley “Burke was hung on 28 January 1829, and his body publicly dissected at the Edinburgh Medical College – the same institution to which he delivered his victims”. For more info, and other creepy objects from the Wellcome collection, see https://next.wellcomecollection.org/articles/Wa6UdC0AAHv5f5tk.